As we start a new year, I can't help but take a minute and look back on all the amazing memories we created in 2016! It makes my heart happy that I was given the opportunity to capture special moments for all these people! It was a year full of beautiful weddings, adventurous seniors, and wonderful families! It's been an amazing year filled with friends that have become clients...and clients that have become friends! I have a special place in my heart for each of you and fond memories that we created during your sessions! So much at Running N Heels Photography changed in 2016! I added new and improved products and services. Products that I love and know will last you a lifetime! I plan to continue to grow in 2017! I have special projects in the works and have already begun talking to 2017 and 2018 Brides and Grooms all about their special days! There will be some minor changes, but I feel like they are going to make things easier for you guys.....that is always one of my big concerns but I'm always continuing to grow so I can give you the best. Thank you 2016! Thank you to all the couples, seniors, and families that trusted me with their memories! Bring on 2017! Running N Heels Photography by Nicole Veselak is a licensed and insured Bloomington IL Family Photographer in the State of Illinois. She is the premier boutique, full-service Bloomington IL Photographer that focuses on capturing moments and turning them into memories. You Will Not Believe What the Twins Did to My Coach Purse! It was finally here!!! It felt like it has been forever since I pushed submit on my pre-sale order! Not to mention that not only was it being delivered today, but the designer just informed us that these new bags would have the new interior fabric and I can’t wait to have my hands on it. Every time I hear a big truck go down my street I rush to the window to see if my new bag is finally here. Just as I finish putting the boys down for their afternoon nap and settle in to get some editing done I hear that knock at the door. It’s here….It’s finally time! I’m not even sure if what I signed was my name, as I smiled and thanked the delivery guy for making my day. I tear into the box and I’m instantly greeted by the smell of my new genuine leather bag…..I know you must all be wondering what brand is this bag…..Because Nicole you have always been known as a Coach girl….and that is true! I was! They made me happy and I was always looking for a good reason to add a new bag to my collection…until now! If you would have asked me 5 years ago, “Nicole, do you ever see a time when you won’t be carrying a Coach/Michael Kors or similar purse?” The answer would have been without a doubt….No, never! But as in most stories, life happened and in my story twins happened. Along with twins came lots of stuff needed to take care of the twins. This meant that the size of my purse and other bags grew. Yes, I easily look like I’m going on a week vacation at any given outing. More than once I have been teased that my purse could double for luggage! I also found some other changes started happening too! My days got even more crazy, I find that I reach more for flip flops over my beloved heels and there are times I leave the house without my hair and makeup being done. One more thing, I found that I stopped looking for reasons to add to my purse collection and it had in fact been over a year since I had made a purchase like this. For something special….something just for me. The simple reason is my priorities changed. I became a mom and their needs and wants (or wants I had for them) outweighed my wants for myself. Along with this change in priorities, my passion for my photography changed! It grew in ways I didn’t know was possible. Now I have loved photography for years, and most of you know that I’ve been in business for 6 years. But this was more about being able to truly turn our everyday moments into memories. Into something I could hold in my hand, seconds in time that will never be lost because I have them captured. And it is this reason that I decided to treat myself to a Mother’s Day gift!! But if this gift was going to replace one of the last few pieces of who I was before I had children….it needed to be good! Let me just say The House of Flynn Vintage Brown Mini Evermore did not disappoint! The Mini Evermore is a handmade work of art! It is a photographer’s dream bag. Room and pockets galore!! Plus, and maybe one of my favorite features, the lining that actually holds the photography gear can be removed if say you just want to use it as a day bag. It gives you the freedom to make the bag work for whatever is on your agenda. On top of all that it is well made! This bag is going to be able to handle anything you throw at it! Did I mention it is gorgeous?!?! People stop and compliment me on it all the time, to be totally honest people actually notice and comment on it more then my name brand purses! People say all the time how they “lost” so much about who they used to be once they became a mother, but there was no downgrade whatsoever here, it was simply finding something that works better for my life. Now I’m able to carry my camera with us and have have it with me whenever I need it with zero worries that it will be damaged. I found myself always wanting to leave my camera at home, because I needed it for my job and couldn’t take the risk of something happen to it. Or I would talk myself out of taking it because I couldn’t stand the idea of having to carry one more big heavy bag. So I was torn, how can I have my camera when I need it but not be stressed over it? Problem solved! With the Mini Evermore I have room for all my mom necessities as well as my camera and it looks great! It was truly designed with a photographer in mind, able to carry so much gear but not really feel like I'm weighted down! I'm able to capture the moments that make up our lives and it doesn’t get better then that! Yes I can always take a picture with my phone...But I don't take the time to print those out...and in a few days I have "replaced" them with new ones and rarely look back at them, and that makes me sad. It is true, the twins have me giving up my fancy Coach purses! It may have been over a year since I splurged on new heels or a fancy purse….and I might not get my nails done as often as I once did (or really ever anymore) but The House of Flynn bags are quality products that I don’t mind spending my money on! They are gorgeous and are made to last! Now I just need to find a “good” reason to treat myself to the matching wallet! I’m not sure when that will be but I know without a doubt I will be back! PS - I am in no way affiliated/sponsored by The House of Flynn....I just love sharing amazing products with my friends! Senior Sessions are always some of my favorite, and Jackson's did not disappoint! I have watched you grow into a handsome young man and I cannot wait to see what is going to come next for you! Spring weather is always a little hard to work with, but so happy we waited for the perfect night! Running N Heels Photography by Nicole Veselak is a licensed and insured Bloomington IL Senior Photographer in the State of Illinois. She is the premier boutique, full-service Bloomington IL Photographer that focuses on capturing moments and turning them into memories. I was at an event on this beautiful night, and I felt like that child out in the middle of the outfield that was running around after a butterfly. But for me tonight, this Bee kept trying to gain my attention. So after I was finished I spent a little extra time enjoying them. Running N Heels Photography by Nicole Veselak is a licensed and insured Bloomington IL Family Photographer in the State of Illinois. She is the premier boutique, full-serviceBloomington IL Photographer that focuses on capturing moments and turning them into memories. That time your friend talks you into going outside to take pictures of the moon....and about half way through you realize your neighbors most likely think you are a creeper because you have gone completely around your house to find a shot with no trees....and failed. But I waited for it to move to a location that I was able to get a shot without the trees....not sure but now I might like the tree shot better. Running N Heels Photography by Nicole Veselak is a licensed and insured Bloomington IL Family Photographer in the State of Illinois. She is the premier boutique, full-serviceBloomington IL Photographer and focuses on creating images and products that will be cherished for generations. Sometimes things are the most beautiful after they survive the storm. Senior year is a very special time, a chapter in your life is coming to a end and a new one is just beginning, and as a Senior Photographer I love that I'm able to help you turn these moments into memories! We couldn't have asked for a more beautiful day for Molly's Senior Session! Plus she was up for going out to one of my favorite locations...the combination was perfect! Plus I love love love all the outfits she brought! Gave us so much to work with. 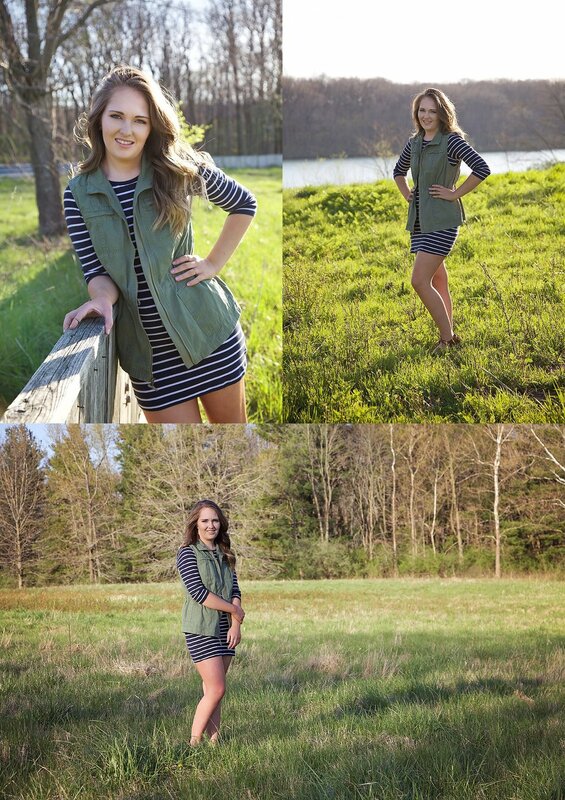 Senior Sessions are always some of my favorites and Molly's ranks right up there with my all time favs! I love that I get a chance to become friends with my clients! I love that I get to watch their kids grow up over the years. This is Annika and I have been taking her pictures each year since 2013! I'm her photographer! We joke that when she is a Senior, that her mom will only have to give me a couple baby photos and I will be able to make her slideshow...but it's true and I would be honored to! Plus I make it a point to make her session in a new location each year! In fact I already have next years location picked out in my head....and I'm working on planning an epic Senior location that we will have to travel to! Thank you Annika and Cheryl for allowing me to be your family photographer...I truly love it!